Over the last twenty years, the use of employment benefit trusts (or EBTs – explained below) has increased in popularity. Whilst EBTs can be implemented for any number of legitimate reasons, they have also been exploited as a means to extract cash from companies without the usual income tax charges1. As a result, HMRC takes issue with this type of planning2 and seeks to challenge it wherever possible. Remuneration planning using EBTs is also the reason why, in 2010, the Government announced3 a new piece of legislation, known as the Disguised Remuneration Rules (DR Rules)4. These rules are designed to stop this type of planning in its tracks. Of course, this did not resolve the problem of those schemes that were already in place, some of which are still being litigated. Indeed, one of the most high profile cases concerns Rangers Football Club5, and its development has been keenly watched by both advisers and their clients. An EBT is quite simply a trust established for the benefit of a particular group of employees, typically all the employees of a particular employer. EBTs are established on a discretionary basis so any benefits provided are determined at the discretion of the appointed trustee or trustees. EBTs are often established as a means to facilitate employee ownership. Typically, an employee share scheme is established to sit alongside the EBT, but the EBT itself could also be established as a vehicle to hold the majority of the shares for the benefit of the employees. The John Lewis Partnership is a great example of employee ownership via trusts in practice6. Philanthropic employers might also establish EBTs with the aim of providing long term benefits from its employees. For example, trusts funds might be used to cover school fees for dependants or to make grants in times of particular need. Whilst Rangers Football Club (the Club) was in the ownership of the Murray Group (the Group), the Group established an EBT for the benefit of the Club's players and other staff members of the Group (note: the current owners are not involved in the dispute with HMRC). HMRC argue that this EBT was established in order to remunerate players and executives without creating a liability for income tax and NICs. In brief, the arrangement was as follows. 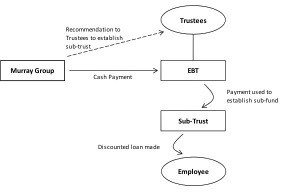 A company in the Group would make a payment to the EBT along with a recommendation that the EBT use that payment to establish a sub-trust for the benefit of a particular employee's family, a recommendation that the trustees of the EBT followed. The sub-trust would then make a loan to the employee in question. These loans carried interest but on a discounted basis. On the basis that this was in fact a loan arrangement and not therefore remuneration, the Group's position was that neither these loans nor the payments to the EBT gave rise to Pay As Your Earn (PAYE) or National Insurance Contributions (NICs). The EBT established 108 sub-trusts on this basis between 2001 and 2008. In contrast, HMRC concluded that these sub-trust loans were a sham and raised assessments for PAYE and NICs on that basis. The Group had some initial success in front of the First Tier Tribunal7 and again at the Upper Tribunal8, when HMRC's first appeal was dismissed. The earlier wins were determined on the basis that the loans represented a genuine exercise of discretion by the trustees of the EBT and could not therefore amount to a sham. However, HMRC appealed again to the Court of Session in Scotland. This judgment was handed down in November 2015 and, on this occasion, the Court ruled in HMRC's favour. What was particularly interesting about this decision is that HMRC raised the "redirection of earnings principle" (defined below). Although HMRC had not argued this before the Tribunals, the Court of Session still agreed to consider it. "This accords with common sense. If the law was otherwise, an employee could readily avoid tax by redirecting income to members of his family to meet outgoings that he would normally pay. ... It follows that, if the principle applies, it is irrelevant that the redirection is through the medium of trust arrangements". Applying this principle to the facts of the case, and emphasising the need to examine the true nature of the transaction, the Court considered the circumstances as they apply to the two main groups of employees who benefitted from this arrangement: the executives and the players. Although the executives had no contractual right to a bonus, the Group had developed a practice of paying discretionary annual bonuses. It is these bonuses that were paid through the EBT structure. Key to the Court's consideration was the fact that these bonuses were paid based on the executive's performance, and the profitability of the employer company, concluding therefore that the payment to the EBT was on account of work done by the executive in their capacity as such. In relation to the players, each player had a contract (subject to PAYE and NICs in the usual way) but also a side letter which provided for the EBT payment. The Court determined that this side letter was in fact as part of the player's employment package and should be properly categorised as a bonus payment. Ultimately, the Court agreed with HMRC's submission and held that the funds received by the EBT amounted to a "mere redirection of income". The Group has since been granted leave to appeal this latest decision so the matter is not yet final 11, but if the Supreme Court also rules in HMRC's favour, this case could have important repercussions, not least for the future of the disguised remuneration rules. As noted above, in December 2010, the Government took steps to introduce new legislation designed to put beyond doubt the fact that this type of planning using EBTs was not effective. Briefly, the DR Rules apply where a "relevant step" is taken by a third party which benefits an employee (current, future or former) in relation to an arrangement to provide "reward, recognition or loans" related to employment or office12. Therefore, if the Rangers arrangements had been implemented post December 2010, the establishment of the sub-trusts and the loans would have been caught by the DR Rules and employment taxes would have been due. The interaction of the redirection of earnings principle and the DR Rules creates an interesting question of double taxation – one that is as yet unanswered and raises the query whether the DR Rules were required in the first place? The Court of Session determined that the tax arises when the funds are advanced to the EBT (rather than the sub-trusts)13. Further, one of the judges in the Court of Session commented that payments from the sub-trusts would not subsequently be taxed as employment income14, but no basis for the decision was provided. This creates some confusion since, under the DR Rules, any payment from the EBT to an employee is specifically taxable by statute. Therefore, arguably, the funds are taxed on entry to the EBT under the redirection of earnings principle and again on exit under the DR Rules, effectively creating double taxation. One hopes that the Supreme Court will attempt to address this apparent inconsistency in the Court of Session’s own judgment. For those employers who reached settlements with HMRC under the EBT Settlement Opportunity15 and opted to treat payments into the trust as employment income, HMRC agreed not to subject any payments out of the trust to tax as employment income under the DR Rules. However, this opportunity closed on 31 July 2015 and it is not clear what HMRC's latest position will be in light of this judgment. Now that leave to appeal has been granted, the waiting period for a resolution just gets longer. If HMRC succeeds at the Supreme Court, we can likely expect any taxpayers with unresolved EBT arrangements to receive follower notices and subsequently advance payment notices16. Follower notices require a taxpayer who has implemented the same arrangements to those which are the subject of a final judicial ruling to amend their tax returns in line with the relevant ruling and therefore pay the additional tax due. Those taxpayers who maintain that their own arrangements are different and therefore unaffected by the judgment will then likely receive an accelerated payment notice17 (if one has not already been issued). Advance payment notices require taxpayers to pay any disputed tax charges in advance of a final determination effectively removing the cash flow advantage enjoyed by users of tax planning arrangements which are ultimately defeated. The legality of advance payment notices has been questioned, but so far any challenge has only been successful if the conditions for issuing the notice were not satisfied18. Any challenge concerning the legality of the legislation itself has to date been unsuccessful19 and so they remain a feature of the UK tax system. Failure to observe these notices can result in significant penalties. Of course, the taxpayer's appeal might be successful and a final judgment in the taxpayer's favour could be a significant setback for HMRC in its fight to tackle tax evasion. Anyone who has been involved in the establishment of an EBT in circumstances similar to the Rangers case and has any concerns regarding that EBT or the implications of the future Supreme Court ruling should seek specialist legal advice. The leading case is Smyth (Surveyor of Taxes) v Stretton which was heard in 1904. This is discussed by Lord Drummon Young in the Court of Session at paragraph 55 of his judgment in the Rangers case.